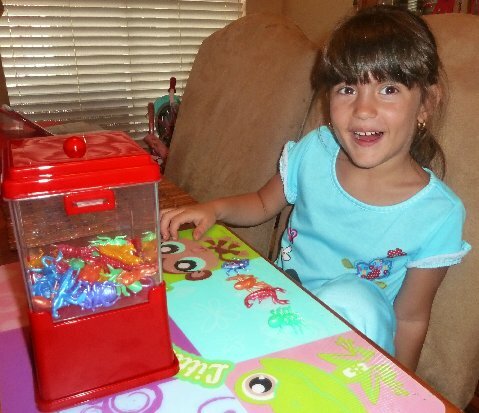 We love Educational Insights award-winning learning toys and hands-on educational materials. 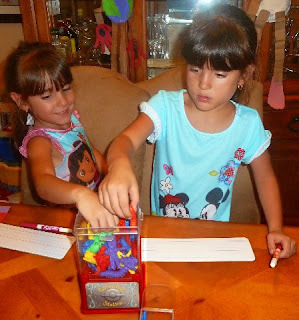 Recently, the Lil Divas and I had the opportunity to review the Estimation Station. Inside the box you will receive one 4" plastic cube jar with a locking lid and a sturdy base, one 2" plastic cube scoop, an activity guide with a week’s worth of activities (including estimation, counting, place value, comparing and ordering numbers, making predictions, graphing, statistics, and mathematical reasoning) and a parent letter (in English and Spanish) with instructions on filling and counting the jar's contents. The Estimation Station is a great way to teach children to make logical estimates. 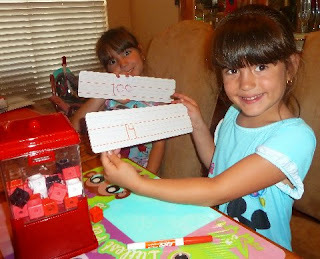 Estimation is new to my Lil Divas but it was great fun to introduce this math concept to them. Since we are involved in an Insect Theme I first filled the jar with our Bug Manipulatives to introduce it. They had a lot of fun trying to estimate how many bugs were inside. I had them write their estimates (perfect way to sneak in some number writing practice too!) and share them. Then we counted to see how many bugs were in the jar! They had such fun they wanted to put other things in the jar. I let them take turnes finding objects to put in and we would estimate how many of the item was in the jar. The Oldest Diva put some different bugs inside and presented the challenge to me and her little sister. Next, I threw in some unifix cubes. and finally the Littlest Diva put in some small blocks for her sister to estimate. This would be a wonderful addition to any elementary classroom, homeschool math curriculum or for any parent that wants to have some hands-on math fun with their age 5-9/K-3rd Grade child. I know many Kindergarten teachers have "Estimation Jars" as part of their classrooms and this one is definitely compact and light enough to travel home with students and would be easy for parents to fill at home and then return to school. 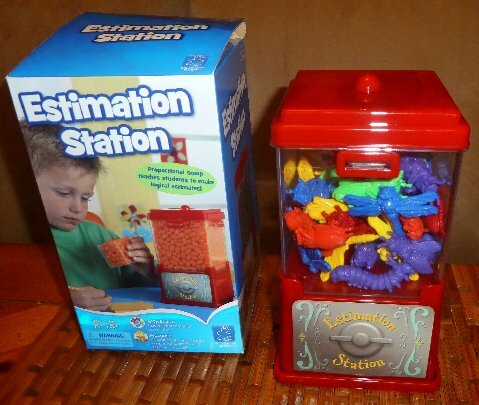 What I like about the The Estimation Station is that the possibilities are endless with what you can put inside. I know my Divas would enjoy estimating marshmallows, balls, lollipops, toy cars, toy dinosaurs and so many other things! We will definitely be using this regularly in our themes at home. 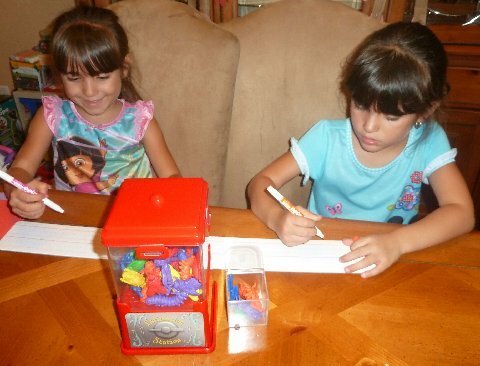 I am so excited that the kind people at Educational Insights will be giving the Estimation Station to one lucky Mom to 2 Posh Lil Divas follower! 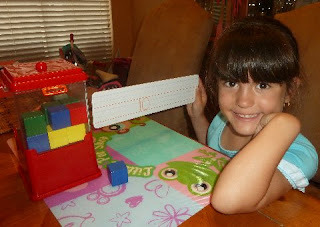 I just know you will love it and get creative doing some fun hands-on estimating with it! Buy It: Purchase the Estimation Station at Educational Insights website. Visit Educational Insights and tell me which of their Active Learning products you would like to try! Make a comment on any non-giveaway post on Mom to 2 Posh Lil Divas Blog and leave a link. You can do this for up to 5 posts but please note that comment must be dated after the start date of this post - not valid on previous comments. 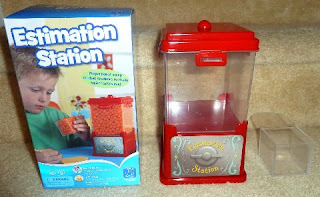 Disclaimer:I received the Estimation Station for the purposes of trying them out for this review. That being said, this review is my 100% honest opinion of this product - I am not paid for my reviews or optinions! They are 100% mine! Please remember that your opinions and tastes might differ from mine. Wow this estimation station looks like a great learning resource! I also think the Design and Drill Activity Center by Educational Insights looks like a lot of fun for the little ones and something I would like to try. This looks awesome! I would love to win it! Found you on the blog hop and I am your newest follower! I would love to have you follow back if you want! What a fun idea and resource! I want one! What would I get? Probably a new set of fridge alphabet magnets... ours got chewed up by our old dog. space faces as my son Nick and his younger brother are obsessed with space right now! btw, how cool is that est station with the cute bugs? Love it. I visited EI, and my little boys would love the Design & Drill Power Tool Workshop. I "Like" EI on Facebook. I follow publicly with Google Friend Connect. I like the bank amerikid atm. My kids would go nuts for that! I like the string along lacing kits! I follow via GFC... publicly. I love their world foam map puzzle! I'd get the string along lacing kits. I would like to try GeoSafari® Talking Globe® Jr.